Spelling bees aren’t all about sequencing letters correctly; they are about effort, managing nerves, and developing a competitive spirit against adversity. 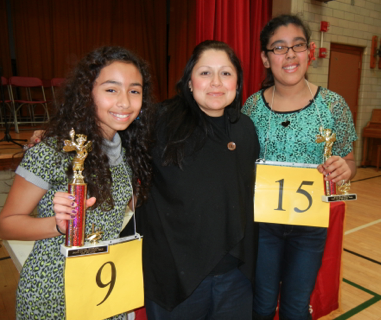 Fittingly, the Byrne Spelling bee’s greatest moment wasn’t about the final result. The competition on Friday, December 6th built intensely through twelve rounds as the field of eighteen whittled down to two. Milany Villa and Ines Garcia went back and forth for four more rounds, then shared a transcendent moment of sportsmanship. As Garcia completed the round, Villa greeted her with a high five. The crowd melted, then cheered. Seeing their exchange, you could sense this was not about winning as much as it was about celebrating high-level student achievement. Then, 6th grader Milany Villa calmly walked up to the microphone. 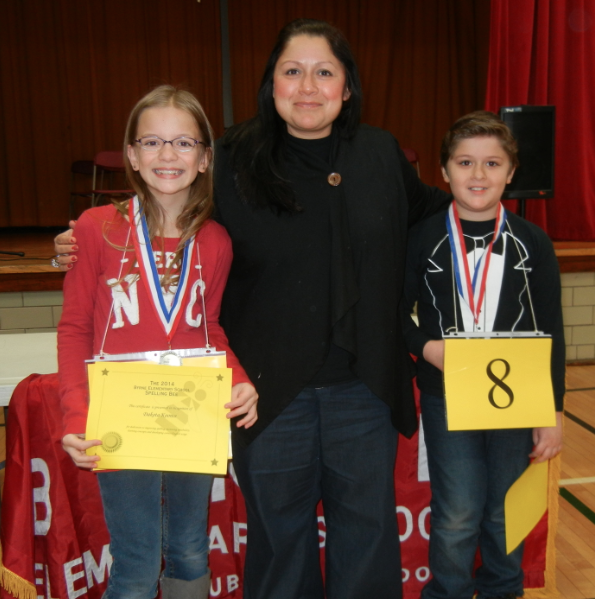 She looked straight ahead and spelled out “seraphic” to clinch the Byrne Spelling Bee championship. The capacity crowd went absolutely bonkers with applause and cheers. Everyone showed appreciation to both students for a legendary contest. More than that, they applauded because these two young ladies won over their hearts. Dakota Koonce won the intermediate bee in spectacular fashion as well, with Robert Schuch coming in a close second. Koonce won on the clinching words “bulwark” and “shiatsu”. All had a great time as the Byrne Spelling Bee taught the students, teachers and parents about spelling and word usage, but also about integrity and sportsmanship. Left to right: intermediate spelling champion Dakota Koonce, assistant principal Elizabeth Gallo, 2nd place speller Robert Schuch. This was a fantastic event. The pronouncer was outstanding. There is nothing more inspiring than watching students accomplish advanced feats of academia.